Remember you can update your own ATM profile! 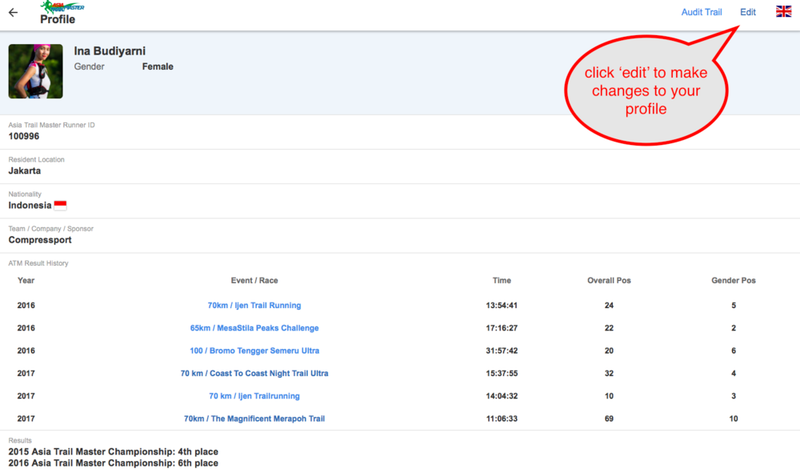 With special thanks to Race Timing Solutions, leading registration and time-keeping company in Hong Kong, we kindly remind everyone that you can edit your own ATM profile. Most of you have already noticed that a lot of things are 'clickable' in the Asia Trail Master Championship ranking interface, and we invite you all to try and click on your name. What you will find is your running profile and history of ATM race performances. You can edit your profile, and add a picture and as much content and information as you like. To do so, you need to follow a few steps first. Essentially, you need a personal password to enter. For runners to access their ATM profiles, you just need to e-mail RTS at info@racetimingsolutions.com and their staff will issue you with a password. Your e-mail address will serve as your log-in ID. Once you are into your own page, you can add content as much as you like. It is YOUR page. Please note that the results database goes back to 2016, when we launched the system together with RTS. The race results of the first ATM season in 2015 are therefore not (yet) integrated into the database. One important element we would like to highlight: the famous ATM ID. 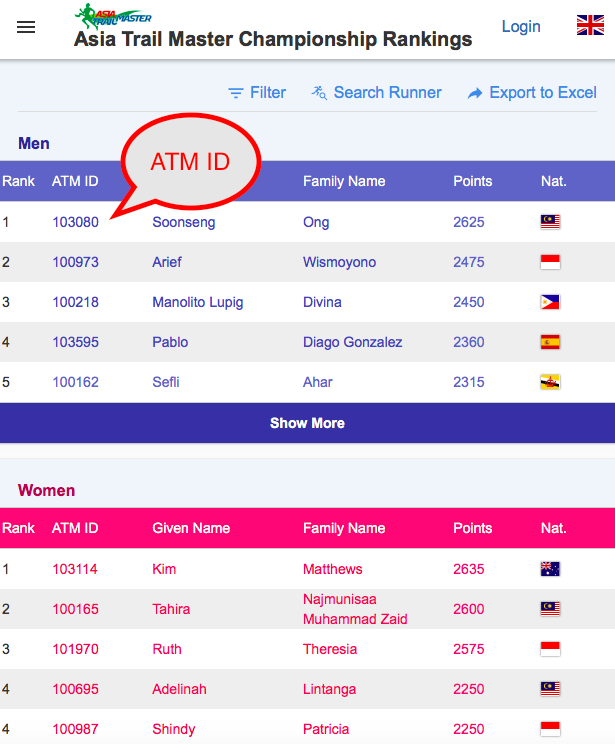 As you can see below, each runner has an ID number in ATM, which is very important as it allows us to add your race results to your profile automatically. We ask and some race registration providers do have a special line in their race form asking for your ATM ID when you sign up. Although not mandatory, we kindly request that you always enter your ID number into this field when requested by a race organiser. This does help us a lot to save time, and will also allow us to update the ATM ranking even faster after every points race. One issue we have is that with so many different time-keeping and registration providers, who unfortunately do not always follow ITRA standards, people get two different profiles because first and last names are mixed up, someone signs up with a nickname, spelling mistakes and so on. But if you add the ATM ID, all these problems won’t occur. We thank all of you in advance for your assistance. Besides, isn't it great to have a track record of all your ATM races in one place? With special thanks to Race Timing Solutions, leading registration and time-keeping company in Hong Kong, we are now ready to officially roll out our race and runner database to the ATM community. Most of you have already noticed that a lot of things are 'clickable' in the Asia Trail Master Championship ranking interface, and we invite you all to try and click on your name. What you will find is your running profile and history of ATM race performances. As of now, you can edit your profile, and add as much content and information as you like. To do so, you need to follow a few steps first. Essentially, you need a personal password to enter. Race registration providers such as Raceyaya (Rizal Mountain Run, Akyathlon, CMU, Sungai Menyala etc) now have a special line in their race form asking for your ATM ID when you sign up. Although not mandatory, we kindly request that you always enter your ID number into this field when requested by a race organiser. This does help us a lot to save time, and will also allow us to update the ATM ranking even faster after every points race. We thank all of you in advance for your assistance. Besides, isn't it great to have a track record of all your ATM races in one place?